There are lots of ways to do this, written on seemingly everywhere. Here’s mine. The jig is constructed from ½” MDF slabs with UHMW plastic runners snugly fitted in the miter slots and screwed from the top face. The left side carries the workpiece while the stationary right side prevents the cutoff from dropping. The fence is made from stable quartersawn mahogany with a handplaned straight working edge. It is secured with four flathead bolts inserted from the bottom, hand tightened with knob nuts. This allows the fence to be squared leisurely, after the initial cut of the MDF on its right side. I can get it very precisely square because it allows for retesting and readjusting. The three finger holes assist in retracting and carrying the jig. Simple, easy, and works beautifully. That’s the way I like woodworking jigs to be. The most important part of this jig and all cross cut sled, is having a square fence, but methods/descriptions for achieving a square fence are often not given. Would you care to share your method for squaring the fence after the initial cut? 1) Plane a straight edge on each of two boards about 4″ x 12″. The boards do not need to have parallel edges. Crosscut an end of each board holding the planed edge against the sled’s fence. Hold the cut ends together with the planed edges facing in the same direction. Use a 24″ straightedge to check for any deviation from straightness of the combined long edge. This exaggerates any error from the crosscut. Adjust the fence accordingly, and retest. 2) Use an approximately 1 foot square piece of flat wood or sheet stock with one nice, straight edge. Hold this edge against the sled fence and crosscut the adjacent edge. For the sled design pictured above, rotate the board 90 degrees counterclockwise (as viewed from above) Now hold that freshly cut edge against the fence and crosscut a new edge. Repeat this sequence to cut the board’s fourth edge. Now rotate the board 90 degrees once more and crosscut off a strip about 1/2″ wide from the edge that you first held against the fence. Check this strip for uniform thickness with a .001″ dial caliper. If it is uniform, your fence is very accurately square! If not, adjust accordingly, being aware that this is a very sensitive method and greatly exaggerates any deviation from square. I really enjoy your informative website. 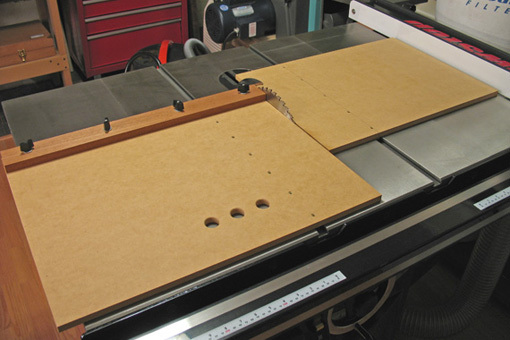 The table saw crosscut sled is one that I would like to make. My question concerns the placement of the fence. I think your sled is the first that I have seen with the fence on the far side. What was your reasoning for this? I thought at first it was just reversed and could be used in either orientation but I checked my Contractor Sawstop table and the miter slots are not the same distance on either side of the blade. 2- Less cumbersome to handle and store (my shop is small). 3- I like pushing the work piece against the fence as I’m feeding the sled forward – it gives it good registration against the fence. In a usual sled you are pushing the workpiece back against the fence as you’re pushing the whole sled forward. 4- The front of any size work piece and most of the mass of the sled start close to the blade before the cut and so are supported by the table as much as possible. In a usual sled most of the mass of the sled starts further back and so may be less stable. 5- I think it is easier to make the small fence on this jig adjustable for accuracy than it is for a fence on a usual sled. Good luck if you build one. then wedged with the rip fence? The piece to the right of the saw blade has a runner attached just like the piece on the left. It fits tightly enough in the miter slot so it is adjustable but does not wander while making a cut. The rip fence plays no part in stabilizing it. Really a very simple jig. What would be the widest width you can safely cross cut with this jig without using an outfeed table on the back of the saw? The table on my saw is 27″ deep. The table on my saw is 30″ deep. I’m comfortable crosscutting 18″ with this jig but I’d say 24″ is pushing it. It depends partly on the weight of the work piece. Please do what you judge to be safe in your shop. I built this cross cut sled a week ago to replace my old cross cut sled and after using it for a week: I consider this sled to be superior to my previous “traditional” sled. Overall, what attracted me to this sled was the simplicity and effectiveness inherent in the design. It was extremely easy to make, and most importantly, extremely accurate when completed. If anyone reading this is on the fence (ha! get it) as to whether or not they should make this jig, get off the fence and into the workshop and whip this up in an afternoon. Excellent jig, thanks Rob for sharing. I’m glad the jig works well for you. Simple and it works!